I should point out that I am not a triathlon coach. I’ve coached quite a few competitive swimmers who have also been triathletes. I’ve trained with triathletes in Masters swimming. And as this region is a hotbed for triathletes, I’ve observed countless dozens of triathletes training on their own over the years. One of the biggest problems of non-elite triathletes is that they often train without a coach. And this fosters endless repetitions of poor technique in all three activities that ends up getting cemented as muscle memory. It also often means personally designed training programs that aren’t optimized for performance improvement. As a swim coach, I couldn’t imagine letting my swimmers train on their own, and design their own workouts. And yet that is the exact basis for the majority of non-elite triathletes. So here are some tips for triathlon swimmers. They apply to all levels of proficiency, but those with a solid program are probably already addressing these. It’s hard to see it on television, but elite freestylers cover a huge amount of water with each stroke, and this is important given the inherent inefficiency of a swimming stroke. 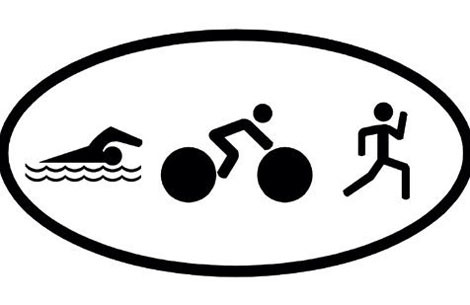 Most triathletes I see have short strokes and a perpetual motion type of movement. A good way to address this is to count your strokes for each length, and then work on maintaining the same speed while taking fewer strokes. This involves lengthening the body, and holding the forward arm at near full extension for a brief time before initiating the stroke. There are too many technical points to get into here, but YouTube has a ton of good videos to study. Competitive swimmers all over the world spend a lot of time doing various drills to help them learn and memorize an optimal stroke. And yet I rarely see triathletes doing drills. Here are two that are simple to do, and effective in improving stroke technique. Finger Drag Recovery: This drill promotes a high elbow recovery where the hand doesn’t swing wide. Just recover with the fingers staying in the water, and tracing a line fairly close to the body. Keep the elbow high. The elbow should initiate the recovery, and the hand should be relaxed. This linear recovery helps maintain the streamline position, while a swinging arm recovery degrades the streamline position. 6-Kick Hold: This drill promotes a long streamlined stroke, with a balanced body position. Just hold the forward arm at near full extension (the elbow joint shouldn’t rotate) and in front of the shoulder (not in front of the head). Maintain this streamline position for 6 kicks, and then pull through and reach this position with the other arm. The body should be stretched out and balanced while holding the position. The hand shouldn’t move during the hold phase, as the core should be used to maintain balance. I understand the idea. A triathlete doesn’t want to use their legs very much during the swim phase, so they do a fair bit of training using pull buoys. But unfortunately, this creates a problem. Pull buoys provide an artificial support for the lower body, and so the core isn’t used to maintain body position. When you take away the pull buoy, the core isn’t ready to do its job. The lack of artificial buoyancy forces the core to work hard in order to keep the body closer to a normal position, while still allowing the arms to do all of the propulsive work. Pull buoy-less pulling provides the basis for an outstanding self diagnostic. A perfectly straight streamlined body during all aspects of the stroke will result in legs that drag directly behind the body at all time. However, any flaws in maintaining the streamline position will cause the legs to drift to one side or the other. This is something the swimmer can sense. As an example, reaching forward in front of the head, or reaching across to the other side, will tend to cause the hip to jut out. This increases water resistance, and causes the feet to sway out to follow the hip. Breathing is another common cause for streamline problems, when the movement of the head and shoulders brings the body out of alignment. This will also cause the feet to sway to one side of the other. By paying attention to the sway of the feet, the swimmer can self diagnose these problems. Swim practices involve mostly passive recovery between repeats, i.e. just standing there resting until the next repeat. This allows energy systems to recover to some extent before the next repeat, and allows for an anaerobic element at the start of the next repeat. For competitive swimmers with races typically lasting 20 seconds and a few minutes, this makes sense. However, triathlons have only one swim which lasts far, far longer than the anaerobic system can cover. This is the perfect situation for active recovery, which involves slow and easy swimming between repeats. Active recovery trains the body to recover during activity, which mimics a triathlon event. In reality, some regular passive recovery is recommended to allow for hydration. As an example, a set of 8 x 200 at 1500 pace with 45 seconds of rest, may be converted to 8 x 200 at 1500 pace plus 5 seconds, with 1 minute between repeats in which an easy 50 is to be done. Not every set has to have active recovery, but it makes a lot of sense to increase the number of such sets. Now this tip may seem paradoxical. Why would someone who only swims 1500s and longer ever want to increase their maximum speed? The answer is that increasing your maximum speed makes your competition speed a lower percentage of your maximum. That is, your body is working at a more comfortable and sustainable level. For instance, tests with rowers have found maximum squat and maximum dead lift are strongly correlated with rowing speed over many minutes. As an example: if your top 50 speed is 30 seconds, and you want to average 35 seconds per 50 for your swim, then you are swimming 17% slower than your maximum. However, reduce your top 50 to 27 seconds, and now you get to swim 30% slower than your maximum. This takes a far lower toll on your body than swimming that close to your maximum speed. Most triathletes are known for training in an unsupervised, unmonitored environment, using questionable training techniques. These 5 tips should help improve technique, efficiency of movement, and effectiveness of training. However, nothing beats joining a triathlon club using qualified coaches. Previous Post The End of the Breaststroke Pullout?